Given I had heard of Dodge City but not Council Grove, I expected Dodge City to have significantly more historic sites. I have to say, Council Grove’s tour provides a much better depiction of the Wild West, despite Dodge City’s acquired nicknames including Wickedest Little City in America, Buffalo Capital of the World, and Queen of the Cowtowns. We started the morning out at Daylight Donuts. It looked like a local place, and it was packed; most of the tables inside filled, a line at the counter, and a line at the drive through. The “Chocolate Butterfly” seemed to be a popular choice among fellow patrons, so I ordered one of those, a standard glazed, and a cup of coffee to go. My breakfast packed so many calories that I wasn’t even hungry again until almost 4 p.m., and I generally graze several times a day! A few blocks behind the donut shop, which I now think might be a chain given I passed by one in the Texas Panhandle, was the old boot hill cemetery site. Between 1872-1876, 32 men and one woman were buried here, many of their names unknown as they died without friends or money. The custom was to bury gunfighters with their boots on or behind their head, thus the name. The graves were moved to a newly created cemetery in 1878. Now the hill is home to a few statues and plaques recounting Dodge City’s history including the fact that Wyatt Earp was called to the City in 1876 to establish law and order. One of the statues is home to a micro cache as well. VANilla bounced along the brick streets to a few more historic site and hidden cache locations. One of the sites I particularly liked, though I didn’t find the nearby cache as too many muggles were at their Saturday morning hair appointment across the street, was the old movie theatre. According to the post on the geocaching site, the theatre was built in 1929 and its biggest feature was the world premiere of the movie “Dodge City”. It is estimated that 60,000 to 100,000 people descended on the City for the event, including national media. Time Magazine even published a photo spread. The cold, overcast morning encouraged Petey and me to keep moving. Before heading west, we drove east of town to take a quick auto tour of Fort Dodge. The old fort once protected the wet and dry route of the Santa Fe Trail. Some old buildings survived and appear to be the center of a small community. We U-turned and started southwest toward Texas’ Panhandle. About 9 miles outside of town, we briefly visited a roadside display of wagon wheel ruts from the Santa Fe Trail that have survived the last 130 years of wind and weather. Here we also logged a virtual cache. In addition, in between the town and the roadside display, I spotted the elusive prairie chicken! I stopped, turned VANilla around, pulled up by the grouse, rolled down the window, and by the time I raised my camera, the bird escaped…UGH! Petey and I spent the rest of the day making up our own scenic tour as Dodge City marked the end of Reader’s Digest’s Drive 69. 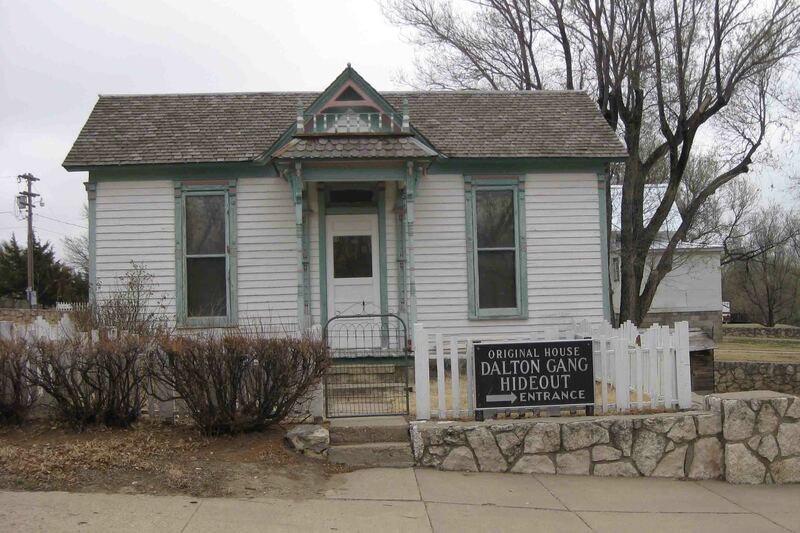 We turned south to Meade, KS and toured the Dalton Gang Hideout. The Dalton Gang consisted of Bob, Grat, and Emmett Dalton as well as a few other men. Bob, Grat, and another brother Frank all served as U.S. deputy marshals out of Fort Smith, Arkansas before the younger brothers turned to crime with their brother Emmett. After their brother Frank was killed while trying to arrest whisky runners in the Indian Territory, the gang left the Oklahoma Territory to join their older brothers in California. Soon thereafter, they began robbing trains. The men were considered so dangerous that a $5,000 reward was posted for each one. The gang left the more crowded areas to hideout in Meade, KS where their sister, Eva Dalton Whipple, resided with her husband John. The boys hid in the barn and tunneled a pathway to the house to pass between the two structures without being detected. In October 1892, the gang attempted to hold up two banks at the same time in Coffeyville, KS. The citizens of Coffeyville heard they were in town and open fired on the gang as they left the bank killing Bob, Grat, and two other gang members. Emmett was badly injured and sentenced to life in prison though he was pardoned after serving fourteen and a half years. Eva and her husband had to abandon their home and settle in Arkansas. While much is known of the gang and their two year crime spree, little is known of the rest of the family which includes a total of ten brothers as the law abiding members of the family didn’t want to be associated with the outlaws. The barn where the gang hid serves as a museum to a variety of items and animals from Kansas. I couldn’t resist snapping photo of this two-headed cow. VANilla rolled across the plains to Liberal, KS next. We made a quick stop at Dorothy’s house and the yellow brick road which was also a site of a geocache which turned out to be “muggled”. The last several caches posted a “Did Not Find”. While I wasn’t hungry, a friend told me to try out the Pancake House which he claims makes the best pancakes in the world, so I stopped by for a pancake lunch around 2 pm. I missed out; they closed at 1 pm. In the meantime, I tried completing a mystery cache. Yes, another type of cache. Clues are posted on the geocaching website and cachers have to figure out the coordinates for the hidden cache. I didn’t spend much time trying to figure out the coordinates, but post named “Flapjacks Anyone” with a picture of pancakes made me think the cache might be hidden at the Pancake House. I thought I would look around, but I noticed the staff inside cleaning the restaurant. I figured I’d look a bit suspicious wondering around the covered porch after hours. My only other guess where the cache might have been was at the church that serves as the finish line for the International Pancake Race. Yes, that is right, the International Pancake Race. The other half of the race takes place in Olney, England. The Pancake Race takes place on Shrove Tuesday, the day preceding Ash Wednesday. In Old England, it was customary for housewives to drop whatever they were doing and hurry to church at the tolling of the bell to be “Shriven” for their sins. In 1445, a housewife began cooking her pancakes too late. Instead of burning them, she carried griddle and pancakes to the church at the sound of the bell which led to the event in England. The event was brought to Liberal after a WWII American soldier from Liberal learned of it from an English soldier. Now dignitaries from each town travel to witness the race, compare times, and declare a winner! While I didn’t find the cache, I did learn of a fun three day event in Liberal. Rather unsuccessful in my eating and caching attempts, I turned toward Amarillo, and as we crossed the Kansas State Line, I turned to my traveling companion and claimed, “Petey, I’ve a feeling we’re not in Kansas anymore”.